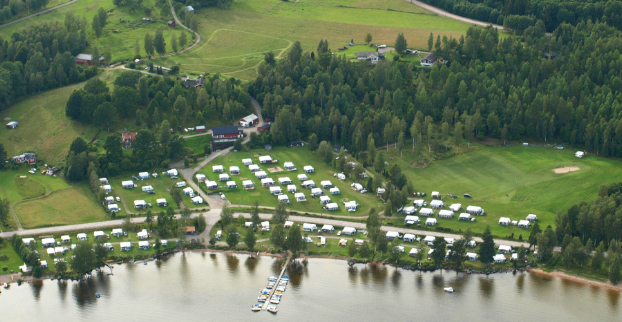 Ekeby Camping lies 13 km south of Årjäng by Västra Silen and Road 172. The first tourists arrived already in the 1930s. To keep the beach clean for the tourists, we started with a dustbin, drinking water and a simple toilet in 1972. Today we offer much more. 100 pitches with electricity on a tranquil family campsite. Ekeby also has a kiosk, café, minigolf, beach volleyball, football pitch, playgrounds, cycles, pedalo, rowing boat, canoes, etc. Relax on a child-friendly, sandy beach. In Västra silen, the water is clear and clean with good fishing, especially for game fish. The lake has salmon, salmon trout, perch, pike, whitefish, pollan, etc. Ancient castle from the Bronze Age with a Borgås man who is 3.2 m tall and built from stone blocks, a fantastic view over Västra Silen and into Norway. The old village of Källtegen, the timber buildings with thatched roofs, and in the courtyard a local performance from the time when large parts of the district emigrated to America, 3-4 July. Walks in fields of hardwood leaves and a rivulet ravine with rich bird life. Farm animals (hens, sheep, ducks, rabbits, etc). Our forests have a rich animal life as well as mushrooms and berries.